With Labor day approaching, the end of summer is almost here. But, there is still plenty of time to celebrate the season. 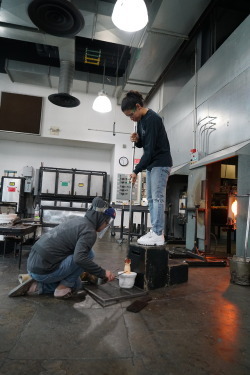 For me, each year this season means one thing: working at The Corning Museum of Glass. For the past four years, I have worked as a part of the Museum’s teen Explainer program: I give tours and use expository carts throughout the Museum to talk to guests about the science, art, and history of glass. In my mind, the Museum is the perfect place to celebrate summer. With my years of experience, I have come to realize an underappreciated art form for capturing the feeling of summer. For some people, summer art is epitomized by a good novel—one read while lathered in sunscreen on a sandy beach. For others, it means the rigid lines or vibrant shapes of a painting displayed in a cool, dark studio. For me, though, summer art is epitomized by rays of muted sunlight streaming into the Museum’s contemporary glass gallery. 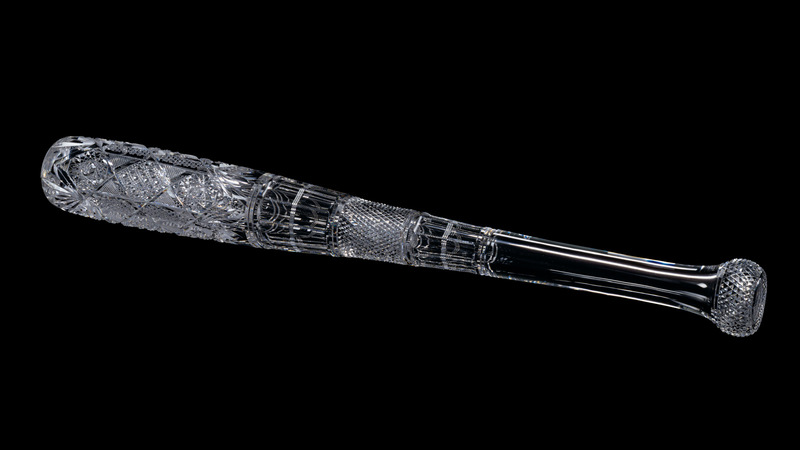 It is a glass fish or a carefully crafted baseball bat—reminders of artists with the inspiration of the season. Murrina with American Flag, Richard Marquis, 1969. 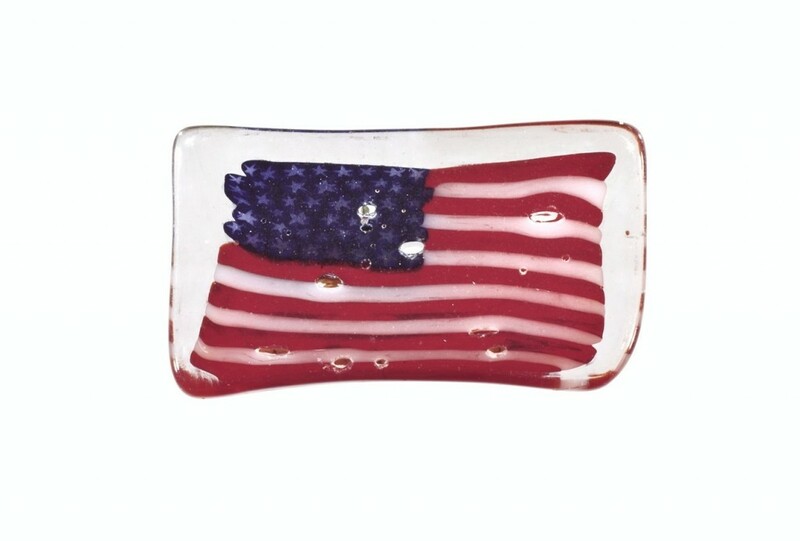 Murrina with American Flag by Richard Marquis: What better way to celebrate July 4th than with an American flag? This piece, from the current Museum exhibition Masters of Studio Glass: Richard Marquis, was made in an elaborate process that involved stretching rods of glass, or canes, in order to create a design. Cut glass baseball bat, C. Dorflinger & Sons, 1913. Glass Baseball Bat: This glass baseball bat was presented to “Honest” Eddie Murphy of the Philadelphia Athletics, winners of the World Series in 1913. The bat was made by C. Dorflinger & Sons, a glass company based in Murphy’s hometown of White Mills, Pennsylvania. 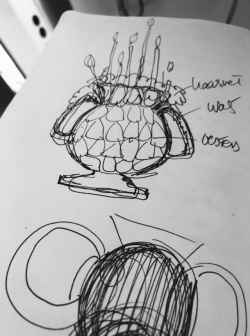 The piece is blown lead glass that was then cut with a cutting wheel to create the design. Cover in the Form of a Fish, Roman Empire, 1-99. Cover in the Form of a Fish: This ancient piece dates from the Roman Empire in the first century AD. 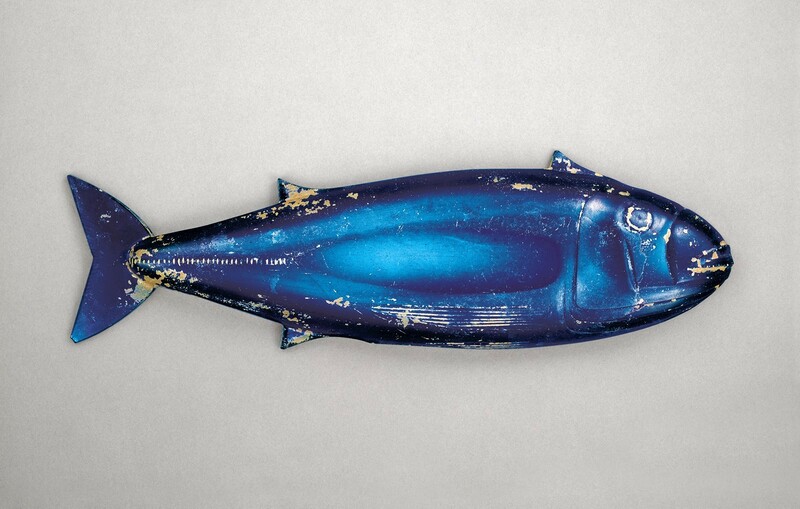 It was cast in a mold and was thereafter used as the cover of a dish for serving real fish. This stylish, clever, and unique serving method could make any modern fisherman jealous, and makes me want to drive up the road to the Finger Lakes. 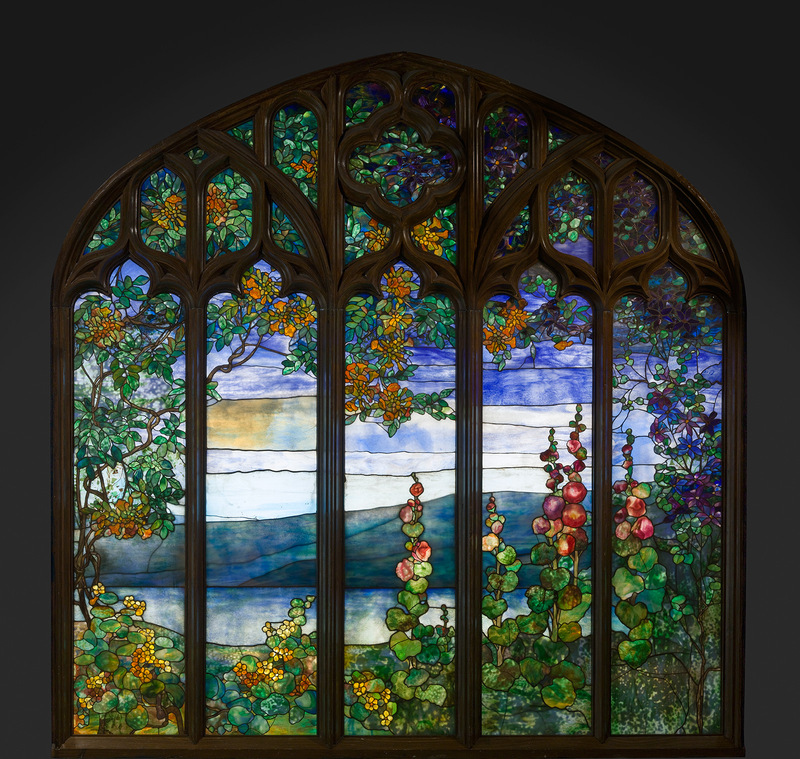 Stained Glass Window from Rochroane Castle, Irvington-on-Hudson, New York, Louis Comfort Tiffany, 1905. Window with Hudson River Landscape by Louis Comfort Tiffany: This piece is a favorite among Museum guests. Tiffany was commissioned by Melchior S. Beltzhoover to design this large window for the music room of Rochroane, a Gothic Revival mansion built in Irvington-on-Hudson, New York. The window depicts the Hudson River landscape as seen from Rochroane’s hilltop location. Beltzhoover’s wife loved the view outside of her window in the summer. With the image immortalized in glass, she could enjoy the perpetual beauty of summer—and so can countless Museum visitors, thanks to Tiffany! Ice Cream Plate, C. Dorflinger & Sons, 1902. Ice Cream Plate: Time to ditch the ice cream cones; come summer, this glass plate allows one to eat in style. This ice cream plate was made by C. Dorflinger & Sons, the same company that produced “Honest” Eddie Murphy’s glass baseball bat. 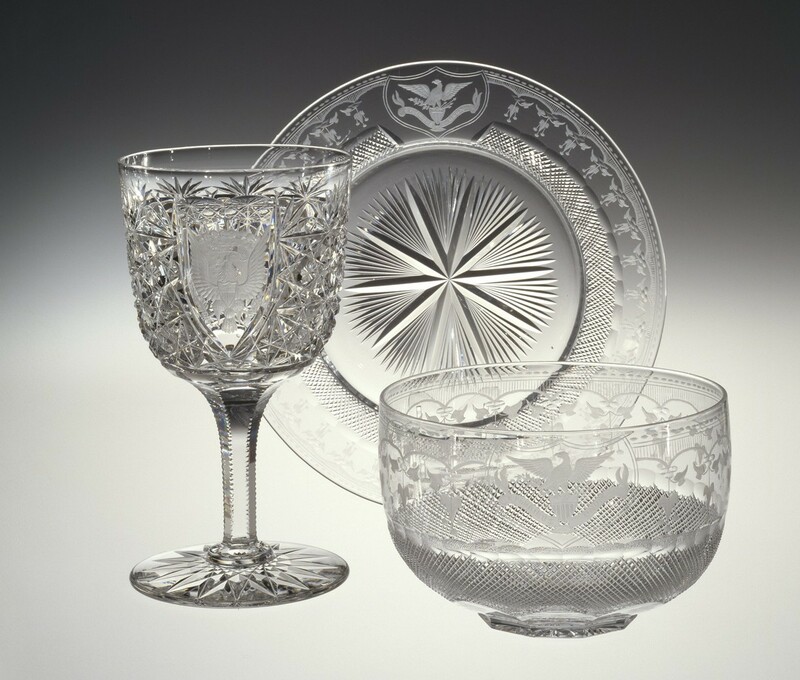 It is colorless lead glass that was blown, cut, and engraved. It is perfectly patriotic: it depicts an engraved shield-shaped cartouche with an eagle, olive branches, arrows, and the motto, “E PLURIBUS UNUM” on a banner below. The service was originally ordered from Dorflinger by Mary Todd Lincoln in 1861, but other First Ladies ordered them, too. This set was probably from 1902.